Tasik Ria was chosen for this workshop because of the excellent mix of diving. From the stunning walls and pristine coral of Bunaken National Park to the more local critter rich reefs just a short boat ride from the jetty, there really was something to suit everybody. After readying all of our kit our first day consisted of relaxing around the pool and getting to know each other, the level of everybody's photography and it let me understand where I could help over the length of the workshop. Our first day got off to a real bang with a visit to Bunaken National Park. The walls here are famous for their sponges, fans and fish life and they didn’t disappoint, the first thing you notice as you enter the water is the abundance of fish life. Thick shoals of red toothed triggerfish and pyramid butterflyfish cover the walls with large jacks hunting smaller bait fish among them. 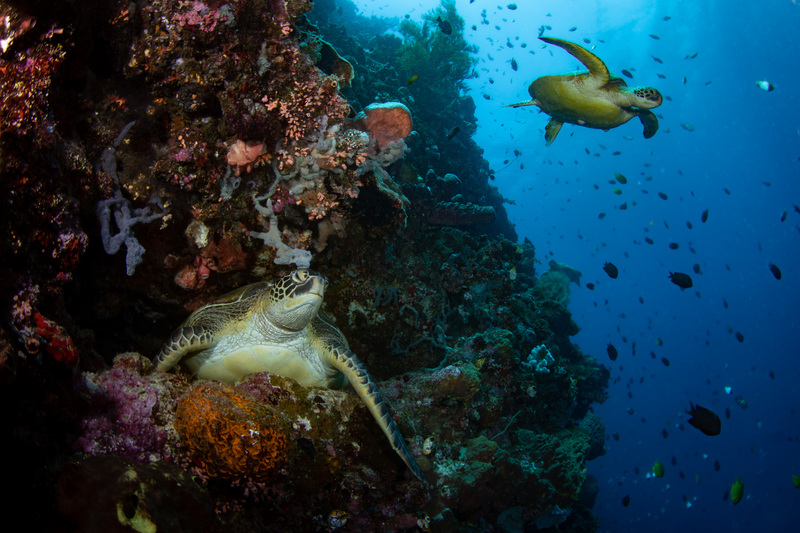 The other thing Bunaken is famous for are the turtles, along the reef wall you will find massive sleeping green turtles and smaller hawksbills often eating the soft coral and sponges. The last time I visited these reefs were 6 years ago and I remember being wowed number of turtles we saw, and things haven't changed if anything there are far more turtles here than ever before. In fact, I would say there are more turtles here than anywhere else I have ever seen. At times there were so many it made it possible for everybody to have their own turtle to practice their photography on and many would act like super models seemingly to know exactly how to pose for the camera. We made several trips to Bunaken throughout the workshop but without a doubt our favourite locations with those less dived and more local to the resort. Unlike Bunaken we were almost guaranteed to have these sites to ourselves. The fish life may not have been as jaw dropping when you first entered the water, but the weird and wonderful critter life was as good as I have seen anywhere else. Our guides were able to often put each guest onto a different subject so allowing everybody to take their time and not feel rushed with the line what people waiting behind them. That’s got to be the worst thing ever for a photographer, hasn’t it? 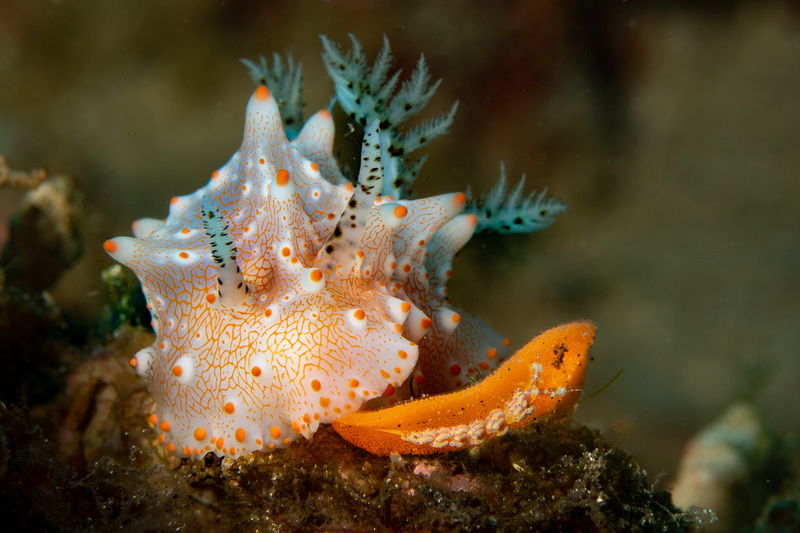 Nudibranch were a real highlight for many people here, from the super small and cute Shaun the Sheep or the bright pink Dorid’s that seem too often have eggs. On the house reef we were also fortunate to find a mating pair of ornate ghost pipefish with the male already caring for the eggs. These were revisited my many over the coming days. 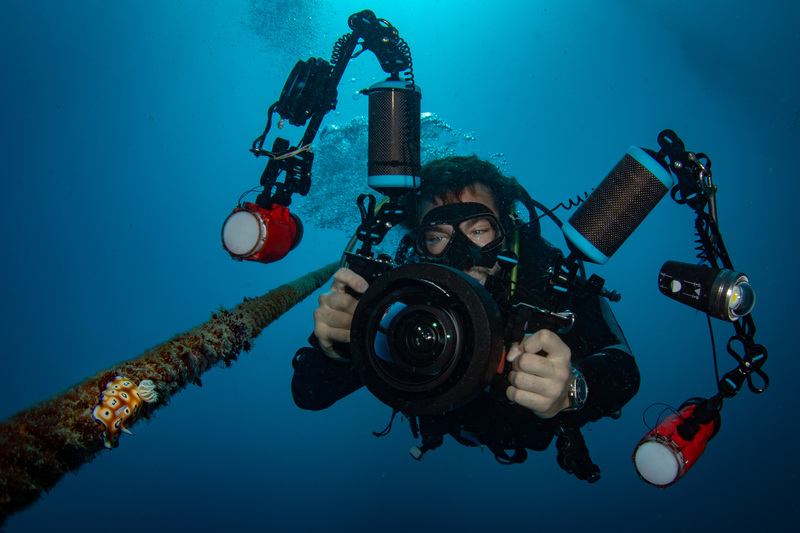 Being on the boat for at least 2 dives gave me a chance to look over guest images as soon as possible and with second dives often on the same reef, crucial advice could be given and put into practice straight away. Most evenings were spent going over editing techniques, talking about camera setting or flash positions all while taking part in group image reviews, naturally with an ice-cold beer in hand but of course we would always pause to watch the amazing sunsets from out outdoor classroom at the jetty bar. Click HERE for details on Saeed's trip to Komodo in 2019.